This piece was purchased in Las Vegas at an estate sale for the late actor Clifton Montgomery. It features rubinesque nudes and children lying and playing amidst trees and ponds. The cherub atop sits on a gold rimmed rock. 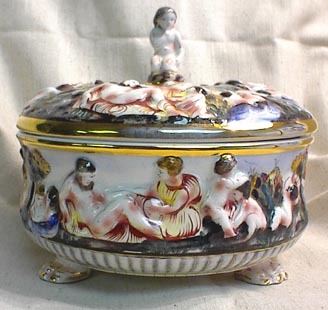 The lid and lip of the bowl are rimmed in gold which has slight wear on the lid. The claw feet are accented with gold. 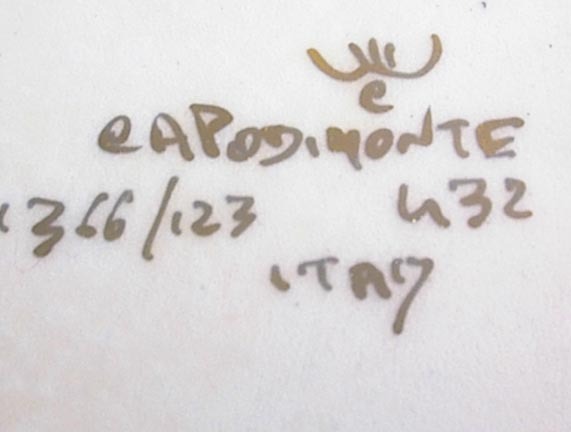 The gold handwritten inscription on the bottom of the bowl says 1366/123 U32, Capodimonte Italy as seen in the picture. 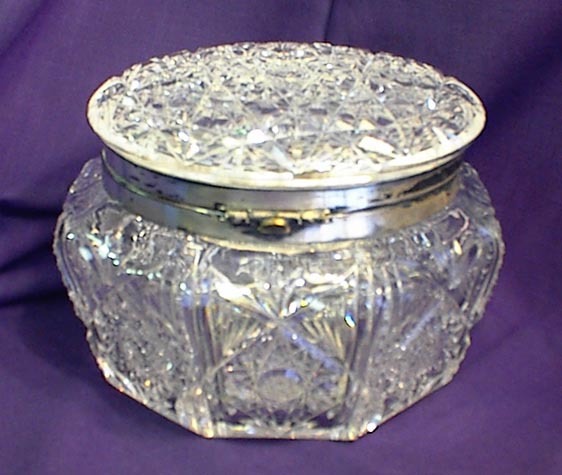 The base of this exquisite Cut Glass Cosmetic Jar is octagonal in shape and very deeply cut. It appears to have no chips or cracks and the edges on all 8 sides appear in excellent condition. 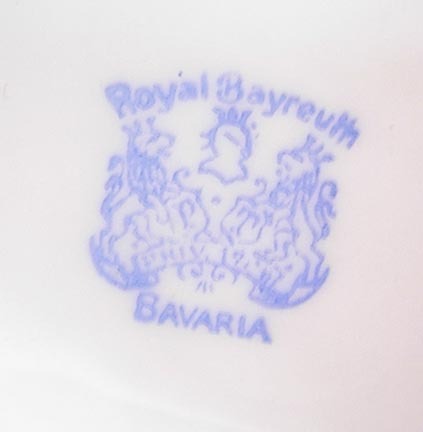 The hinged lid is round in shape and also deeply carved. The lid has several minor chips on top but they are not discernible to the naked eye. Inside the lid is a beveled mirror that swivels on two points. The mirror insert has no chips or cracks and fits snugly in the lid as designed. The base of this piece shows some wear marks but less than what you’d expect with a piece this old. The lid and base are secured by 2 silver rims with a 4-lug hinge. 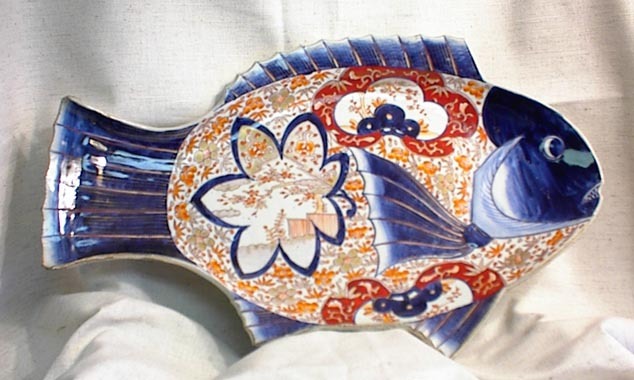 This very old and beautiful platter is quite deep with no chips, cracks or crazing. The fins, tail, and head are in dark blue. The body contains designs of blood red, orange and gold. 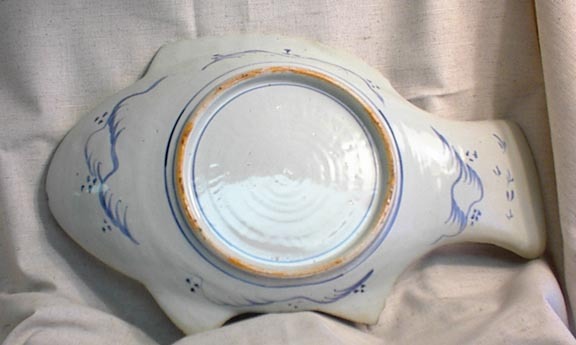 The underside of the platter has one narrow blue line circling the inside base and 3 narrow blue circles on the outside of the base. There are designs at the tail and head as well as both top and bottom fins as seen in the picture. 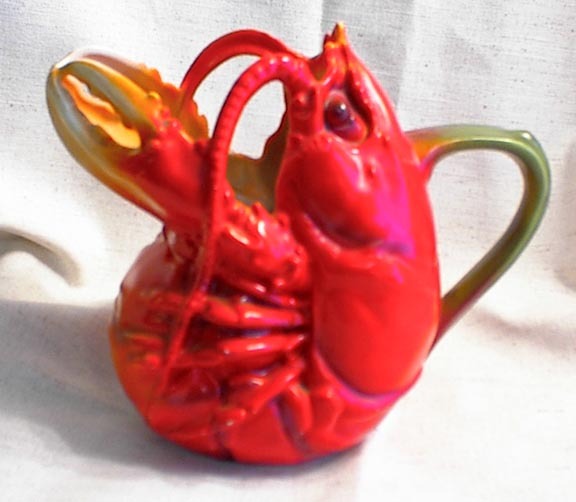 This Lobster Pitcher is red orange with a green handle and fading orange claws. The detail in this piece is wonderful. This piece is in perfect condition with no chips, cracks or crazing. There are, however, 2 or 3 miniscule white specks near the bottom. This set features beautiful birds in shades of blue, pink, yellow and green flying among some pine branches. 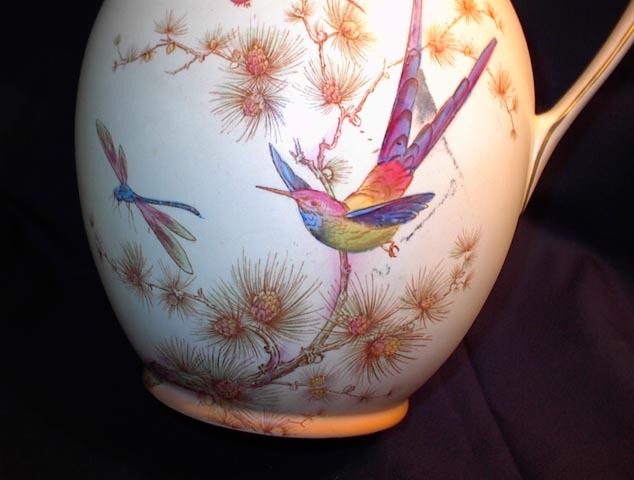 The back side of the pitcher has a large butterfly also with the pine branches. The lip and handle of the pitcher are accented in gold. This pitcher is in mint condition with no chips, cracks or crazing. 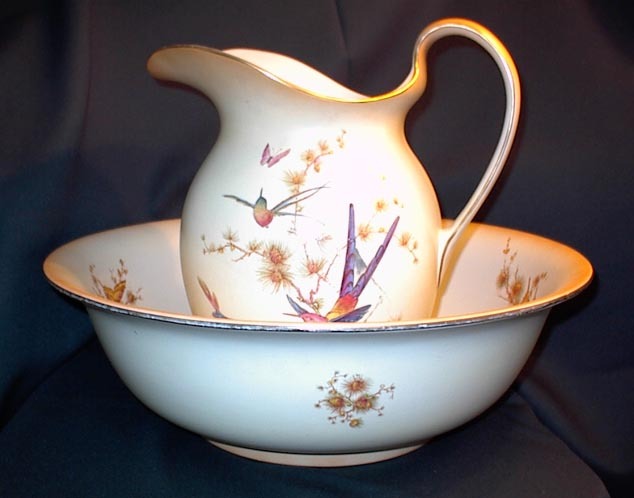 The basin features the birds on two sides of the bowl’s interior and butterflies on the opposite side. The exterior of the basin has small likenesses of the pine branches. The basin is also rimmed in gold. The bottom of the basin does show some signs of crazing but is otherwise perfect. 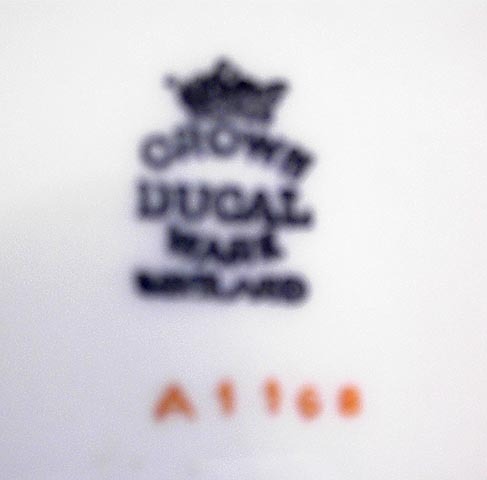 The markings on the bottom of both pieces is the Crown Ducal Ware England stamp and has the number A1160 under the stamp as seen in the picture. This iron ship doorstop is stamped “Santa Maria” on the backside of the front sale. The estimated age of this piece is 50 years. 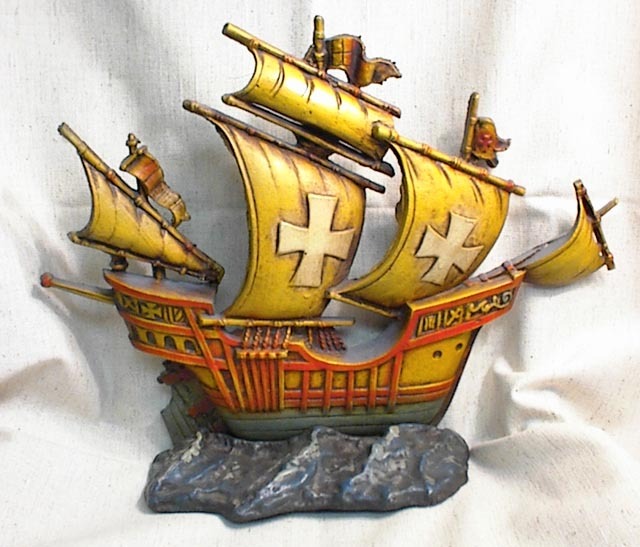 This piece depicts a ship with sails billowing on a rough sea. The sea is dark blues and grays. The sales and masts of the boat are browns and tans. The body of the boat is done in yellows, oranges, and green. The paint and finish appear to be original and are in perfect condition.